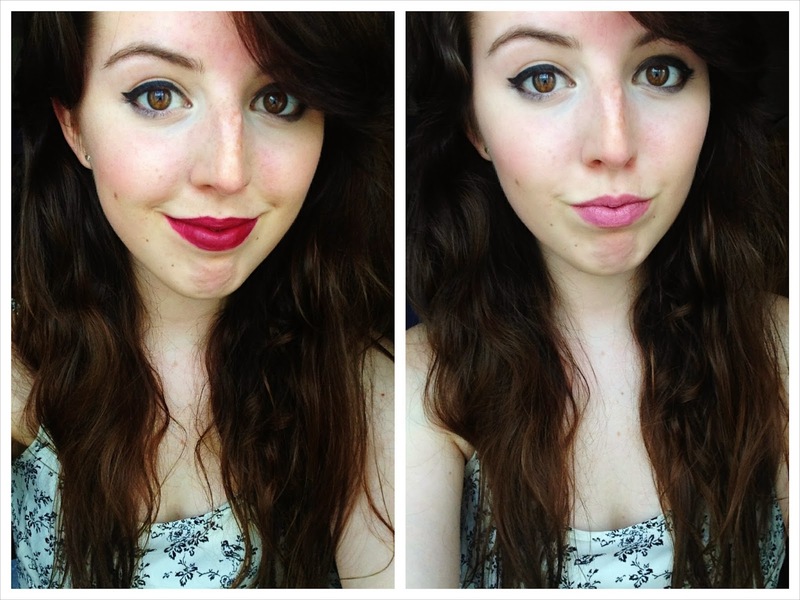 Over the last few months I've gone from zero to hero with my lipsticks. Well okay maybe not hero but I've certainly increased my measly lipstick collection from about 2 (which were horrid and old if I'm honest) to a nice little bunch of high street brands. I've seen so many people raving about the Kate Moss collection with Rimmel, I had to have a go, and oh yes, I am very happy with my purchases! I just want to say, I had so much fun photographing these, but was terrified the wind was going to blow and they'd fall and get ruined. Thankfully that didn't happen! Okay so first up, price, at only £5.49 each, these are a bargain! I am on a tight budget at the moment so I'm always on the look out for products which I can afford but work really well. These fit that criteria extremely well. I went for the matte shades of the range, as I much prefer this style, and didn't actually own any matte lipsticks. Gotta start somewhere ey! I was drawn to shade 107 because I already have a bright red, but this is a little darker, and as I grow my collection I'm finding I'm more drawn to the darker shades. In my head they suit me a little better. It's so lovely and deep and I think it has an ever so slight plum undertone. In other words, I love it. It's great if I want to make a statement without being too in your face, and I did just that in my last insta post. This lipstick be used often, and I may need to purchase another when I have some money to keep in my bag at all times! Also, I'm not having a dig at people who do swatches on their arm or wherever, but for lipsticks especially I don't find that helpful at all. Our lips are a pinky shade, I want to know how the colour is going to look there, not on regular skin. Anyone else or just me? Okay, next up shade 101. As I said, I'm currently leaning more towards darker shades as I build up a collection, but I thought, Becca, it's the middle of summer, brighten up a bit! This shade does just that, it's a really cute pink shade and can be worn on a daily basis so easily, with little maintenance. The texture of both these products are lovely, they're feel quite creamy on the lips, and considering they're a matte formula, they actually feel incredibly moisturising to be honest. You can build the colour up more if you want to with extra layers, but they have pretty good pigmentation as it is. Shade 101 is quite a cool tone, and I really think you could work this all year around. Especially if it was snowing. Can you imagine if it snows? Ah I hope it snows! I feel like I made good purchases here, I've got something for nights out and the winter months, and a more everyday shade which makes me look a little more summery. I'd honestly recommend these so much, especially if you like a matte shade as they're so affordable. I purchased mine from one of my visits to Boots (which are becoming more and more frequent, not helping my bank account at all!). Do you have any bargain matte lipsticks you love? Let me know as I want to try out some hidden gems!